All work and no play makes Jack a dull boy. Or so the saying would have us believe. It’s rather old fashioned, but it’s an adage that gained near cult-like status thanks to Stanley Kubrick’s 1980 movie The Shining, where the lead character types the phrase repeatedly across reams of paper. Now a report recently published by City, University of London provides some evidence in support of the theory. The report, published by City University in London, analyzes micro data from almost 52,000 employees across 38 different European countries and concluded that all work and no play might just hamper your career prospects and damage your health. That might sound counterintuitive. After all, surely we’ve all been led to believe that there’s no substitute for hard work and long hours, and that the harder we work the better. Yet across a wide range of criteria the conclusion was clear – hard work will not always yield rewards. Humans need both physical and mental rest in order to recover between tasks, otherwise they can become stressed and fatigued. And that has serious implications for productivity. Factors the researchers looked at included access to training, task uncertainty, recognition, satisfaction, teamwork, employee discretion, and a long list of others. The authors point out there may also be other contributing factors: high-performing employees may garner more leniency from their managers, for example, while those who struggle come under more pressure to increase their efforts even though their chances of progression are lower. As with all things people-related, the advice is to beware jumping to binary conclusions. The reality is often far more complex than it at first seems. But the report’s findings were weighted to take some of these variables into account and limit their effect on the overall conclusions. One of the most important factors identified was employee discretion, ie having the flexibility and autonomy to choose when a task would be completed. “Employees with greater discretion report lower levels of stress and increased job satisfaction and well-being, and they tend to be more involved and committed,” the report says. Greater levels of discretion can also help avoid work-life conflict situations, the report finds. And with survey after survey stressing the importance to younger employees of being able to blend work and home commitments, that’s perhaps not surprising. Stepping outside of those softer benefits, the report also found greater levels of employee discretion are related to lower staff turnover, which is good news for employers. It’s also a good indicator of career progression opportunities. Rigid deadlines and tight schedules make sense where project management milestones are concerned. But they can add unproductive stress – especially if the need to hit a deadline begins to supersede the desire to do high quality work. This can lead to diminished fulfilment, and greater levels of anxiety and dissatisfaction. Being able to complete a job to a higher standard, even if it means working overtime, does less harm. General increases in pressure on employees, in particular where there has been a dislocation of responsibility and autonomy, can also lead to health concerns. A decline in well-being observed in the UK nursing profession during the 1990s was “associated with a combination of rising work effort and declining task discretion,” the report states. Employee well-being is set to become increasingly relevant as the role of automation shapes much of the conversation about the future of work. 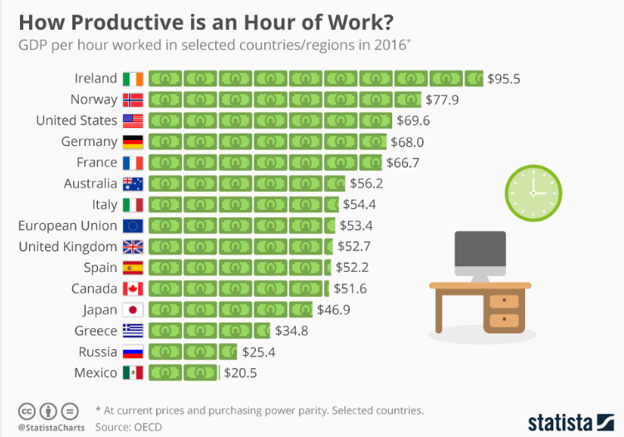 There have already been moves to limit working hours in South Korea and Japan, both of which have a culture of long hours coupled with relatively low productivity per capita. In Europe, the European Union’s Working Time Directive 2003 was created to cap working hours, while the French government has recently passed legislation to protect employees from the pressure to check work email during non-work hours. What is missing, however, is any clear guidance from policymakers on limiting not only the number of hours worked but also controlling the pressure and intensity during those working hours.